Kingdom of Time 1 Day 2009 - Time Currency Notes, Paper Money, World Currency, Banknotes, Banknote, Bank-Notes, Coins & Currency. Currency Collector. Pictures of Money, Photos of Bank Notes, Currency Images, Currencies of the World. Front: Red-tailed Hawk (Buteo jamaicensis) in the mountains above river. Sun. Stylised Sun watch. Back: Moon and stars. Masked Owl (Tyto novaehollandiae) or Barn Owl (Tyto alba). Luna Moth (Actias luna). 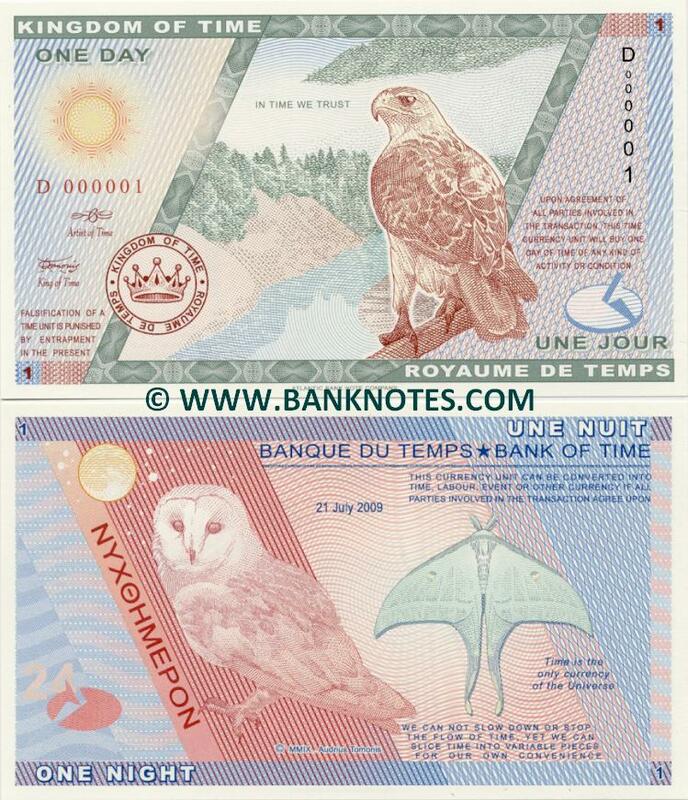 Copyright © 1998-2012 Banknotes.com All rights reserved.